Name, age, hometown: Cathy Rakowski, 20 yrs. old, South Lyon, Mich. What corps are you in and what is your role this summer? I am currently in my third year at Phantom Regiment, and I am a soprano/trumpet player in the horn line. Where I go to school and what I'm studying: I go to school at Michigan State University (currently a junior), and I am studying elementary education. Give us your full drum corps/marching music background. 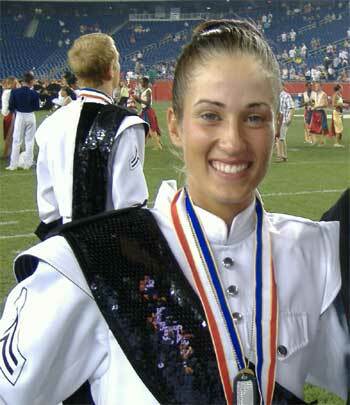 I came from a competitive high school marching band, which participated in BOA regionals. We only competed for three of my four years of high school due to the new band director, but that is where I found out and became interested in drum corps. My band director would get a carpool of people down to the Glassmen All-Star Review in Toledo every year, and that's where I first saw Regiment, and I was always impressed. I decided to audition after I had started my first year of college, and that was for the summer of 2004. I have been a member ever since, and I have two years left (2006 and 2007) before I age out. What does your ideal free day consist of? My ideal free day is just one where I can relax! I love to go to see the sights, but too much walking around can be no fun, not to mention tiring. I like going to the beach, or something where I can sit, relax, and have a ton of fun with all my friends. Oh yeah, and eating a ton of junk food is a must. Favorite pig-out food: I would have to say hamburgers would be my food of choice. In the shower you can hear me singing: In the shower we usually have casual talk (over the summer that is), I'm not usually the one who's singing, haha, but I know people who do. I prefer to keep my singing voice inside. The last good book I read: "Bridget Jones' Diary" by Helen Fielding. The last great film I saw: It's a tie between my favorite comedy, "Anchorman," and my favorite drama, "Phantom of the Opera." And yes, I did like SCV's show in '89. Jobs I have/have had: I worked in the school cafeteria, worked at a bookstore shelving books, I've been an animal sitter, and other various odd jobs. My favorite TV show: "Grey's Anatomy"
What has been your formative drum corps moment? My favorite drum corps moment was probably when I performed at my first show. That experience shaped the way I was going to change my life. That was the beginning of a new chapter in my life. Also, the next-highest moment would have been my first time performing on finals night, that was amazing. What would you be doing next summer if you were not marching? Working, most definitely. But I can earn money another time, this is a once-in-a-lifetime opportunity. How did you decide to be a member of your corps? Well, it was all kind of luck that I ended up at Regiment. I knew people at Michigan State University that were from Regiment and they took me under their wing. As soon as I got to the first camp I knew I wanted to be there. I am so glad to be a member of Phantom Regiment. What first attracted you to the drum corps activity? When I first saw it live at the Glassmen All-Star review in Toledo, Ohio. That's when I was blown away by the whole thing. What advice would you give to young people who want to march? You pursue your dreams, and know that there is no harm in trying. I would encourage people to at least give it a chance, because it changes who you are and how you live after you experience it. Taking chances is what life's all about. What I want to be when I "grow up": I want to teach elementary school students, maybe 3rd or 4th grade, and I want to tech at the local high school's band. I always want music to be a part of my life. Favorite drum corps personality and why: My favorite drum corps personality is Brandt Crocker, because hearing his voice is hearing what drum corps is all about. I always get so excited on finals week every time he announces us. That is something that is so unforgettable. Best drum corps show ever and why: That's tough. I would have to say the best drum corps show ever was either Regiment '89 or Regiment '96. Now, obviously I am partial to my corps, haha, but those shows were milestones in drum corps history, and everyone knows at least one of them. If I were to pick one outside of Regiment, I would say that either '95 Scouts or '89 SCV would be up there, because those shows were just phenomenal. The year is 2030. What does a DCI show look like? I hope that drum corps will still remain fairly the same, but maybe the level of difficulty will rise. I like how it is challenging and so intricate, yet so simple at the same time. I hope the same basics stay, maybe with some artistic modifications.